"We've had to survive without the Light all our lives." Suraya Hawthorne is a human female sniper who left the Last City as a teenager to seek a new purpose. She has taken up residence in the newly established Farm in the European Dead Zone, working closely in conjunction with the Vanguard throughout the Red War. After the reclamation of the Last City, Hawthorne moved back to the City and took up residence in the Tower to serve as the overseer of Guardian clans while also providing a voice for the non-Guardian citizens of the City. "But non-Guardians aren't supposed to leave the City!" "Here's the thing about City rules – they stop applying once you leave the City." After being orphaned at a young age, Hawthorne was taken in by Devrim Kay and his partner, Marc. The two raised Hawthorne with care, emphasizing that she always be sure of herself, and to do what she thought was the right thing, always. Nevertheless, Hawthorne still felt trapped within the confines of the Last City's walls, as well as its rules. 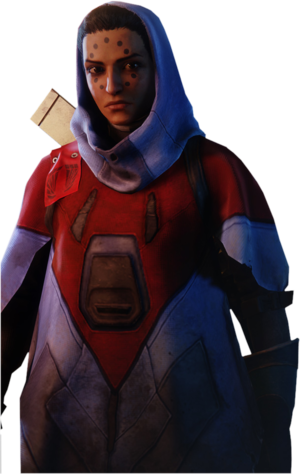 On many occasions, Hawthorne would get into trouble with the local law enforcement for fighting, often ending with Devrim bailing her out of jail.. She also resented the city factions- most notable New Monarchy- due to their exclusionary nature, and began stealing their supplies in spite of them to aid those in need. On one such occasion, Hawthorne was caught in the act by Executor Hideo. She fled, but not before breaking his nose in response to a barrage of insults directed at her. Rather than wait for Hideo to have her exiled, it was there that Hawthorne decided to leave the City on her own volition. After expressing this desire to her guardians, the latter pair decided to leave with her. Hawthorne refused, not wanting them to uproot their lives due to the consequences of her choices. Eventually, Devrim and Marc agreed to stay, provided their adoptive daughter stay within proximity so they could visit. Having come to an agreement, they devised an escape plan while Marc distracted Hideo. Afterward, Hawthorne remained close by for at least a year before venturing off to see the rest of the world. She survived on her own or in small groups, and at some point met her falcon companion, Louis. Hawthorne explored much of the European Dead Zone, although she kept her distance from the Shard of the Traveler. Hawthorne and Louis in a staging area outside of Twilight Gap. "We've got refugees coming in, the Red Legion on one side, the Fallen on the other -"
"But we have our powers back. And if we're going to retake the City -"
While gathering supplies to take to the Last City, she learned that it was under attack by the Cabal's Red Legion. Abandoning the supplies, Hawthorne flew across the ocean to help, but the City had fallen. Hawthorne began aiding survivors as they fled from the City and rallied them at the Farm in the European Dead Zone. One week after the fall of the City, Hawthorne was aiding survivors outside of Twilight Gap when she saw a Lightless Guardian fall from a nearby cliff. She went over and aided The Young Wolf back onto their feet, but a distant explosion cut their introductions short. Hawthorne ordered her people to get ready to move. The Guardian's Ghost questioned where they were going, and Hawthorne told them as far from the City as possible. Louis then swooped in and landed on her arm, and she introduced herself and Louis to the Guardian. She questioned if they were fit to fly and handed them her shotgun before remarking that it was time for the Guardian to make themselves useful. Hawthorne ordered her people to leave and prepare for the long flight home. As their ships reached the Farm, Hawthorne welcomed the Young Wolf to their new home, but the Guardian was more interested in the Shard of the Traveler they saw in the distance, which Hawthorne warned them was dangerous. The number of refugees at the Farm made Suraya nervous, as she was used to living alone or with few people around. She met with the Young Wolf and informed them she would not stop them from investigating the Shard as she had too many other issues to deal with, but did provide them a ship, the Wanderwing, to reach the Shard faster and return quicker. When the Young Wolf reached the quarantine area, she contacted them and inquired if they were sure it was a good idea, as the Shard's corruption was what had turned the region into a Dead Zone. They insisted that the they had to, and Hawthorne mentioned she had avoided it herself despite exploring elsewhere in the EDZ. The Guardian's Ghost protested that as a non-Guardian she was not allowed to leave the City, but Hawthorne told them that City rules did not apply outside of it. She directed them to a gap in the wall around the quarantine zone, but lost contact with the Guardian due to the corruption's interference. When the Guardian returned to the Farm, Hawthorne was pleased they had regained their Light and told them they would need it to help aid the scattered refugees fleeing the City. She asked them to meet Devrim Kay in the Dead Zone to help him set up a communications network that could spread word that the Farm was a safe haven for refugees. Hawthorne placed a transmitter at the top of a mountain outside Trostland, but discovered that the signal did not have the range they were expecting. To start fixing the issue, she and Devrim requested the Young Wolf place signal amplifiers around the region. After the first one was placed, Fallen began pouring into the area. Hawthorne wanted the next one set up quickly, and as the Young Wolf headed to the designated location, she noted how peaceful the area used to be and that the Fallen only started showing up after the Red Legion assault. Hawthorne also began positively comparing the Farm to the City, believing it to be better due to the lack of walls and ability for its inhabitants to leave whenever they wished. When the second beacon was placed Hawthorne detected feedback on the channel, and they realized the Fallen had jamming devices in place. Once the jamming devices were destroyed, Hawthorne requested the Young Wolf recover the supplies she had abandoned nearby when she learned the Last City was under attack. Unfortunately, the Fallen had gotten to the supplies first. Hawthorne requested the Guardian clear them out and plant one final signal beacon. The Young Wolf drove the Fallen off and suggested the supplies would aid the City when they retook it, but Hawthorne was skeptical that would be a good thing. When the Guardian began returning to Devrim, Hawthorne began picking up feedback once more on the refugee comm signal. The Guardian's Ghost reported that the Fallen had deployed Shanks with jammers, and used to one to trace the Fallen signal to a nearby comm tower. 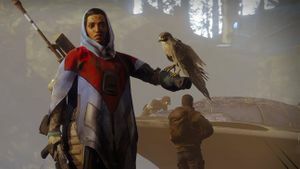 Hawthorne wondered why the Fallen kept jamming their signal, and Devrim speculated they were angry at losing the chance to take over the EDZ and taking revenge. Disgusted, she noted the Fallen were too scared to face them head on, and the Young Wolf soon traced the Fallen to an underground base. As the Young Wolf assaulted the Fallen base, their Ghost stated they should clear out the caves for good once the Last City was freed. Hawthorne countered that they could instead leave the Fallen alone in their caves and not potentially risk anymore lives. The Young Wolf shut down the jammers sending the signal to the shanks and destroyed the Fallen's broadcasting equipment. Hawthorne was pleased, noting that once the last jammer was set up their signal would not just reach Earth, but the rest of the solar system as well. Hawthorne then asked Devrim when he would bring the signal booster to the transmitter above the salt mines, and he informed her that the Young Wolf was on their way with it and that he was too old to climb a mountain and keep looking cleaning up after her. She was glad he had finally admitted to being old, and noted that bailing her out on one assault charge did not mean he could lord it over her. When the Guardian reached the top of the mountain, Hawthorne thanked them for bringing the booster and told them they were not so bad for a Guardian. As she installed the booster Hawthorne was surprised there was an incoming beacon from Commander Zavala, who was rallying Guardians on Titan. As the Young Wolf and their Ghost became excited, Hawthorne angrily cut the message off and told them they were not going to Titan, pointing out that they had the Cabal setting up a warbase on one side of the EDZ while the Fallen claimed another, leaving the Farm and its refugees in the middle. The Ghost protested they would need to retake the Last City, but Hawthorne screamed at them the City was gone before grabbing her sniper rifle and preparing to leave. They told her they would be back with help, and she dejectedly told them they would know where to find her. Before they departed for Titan, the Young Wolf aided Hawthorne and Devrim in one final task by planting a false message to trick the Cabal and Fallen into fighting each other in the hope it would distract them from the Farm and refugees. As the Young Wolf gathered intercepted Fallen transmissions, Hawthorne warned them not to mention accents around Devrim, as he would not stop talking about them, while also recommending they use the cliffside where they set up the last comms beacon as an ambush spot. After the Guardian acquired explosives and set up the ambush, the Ghost sent a message insulting Ghaul and mentioned using a specific Fallen accent (Confirmed possibilities: House of Devils, Marauder). Hawthorne was annoyed as Devrim began to talk about the finer points of the accent, but was soon cut off by the Ghost as the ambush began. Three Cabal officers were killed in the attack, and after Devrim noted he could hear the explosions from Trostland, Hawthorne noted that this should keep both the Cabal and Fallen in conflict for some time. "Are you sure you're not one of my Hunters?" Hawthorne is a woman with olive skin, sporting a circular pattern of dots atop her face. She is shown to be very ambitious, earned through years of surviving on her own without the Light, able to stand her ground against the Cabal. She has a companion falcon named Louis. Suraya possess a conflicted view of the Last City and the Guardians; while she respects the Guardians for their abilities and their priority of defending people, she finds the City and its walls to be equivalent of a prison as she has enjoyed the open freedom of the wild. While she aided the survivors of the Last City and the crippled Guardians, she was originally against the idea of reclaiming the City or even going against enemy forces, preferring to protect those at the Farm. Despite this mindset, Suraya aided the Vanguard in their efforts in reclaiming the Last City, becoming instrumental in getting their forces through the Wall undetected. She saved Commander Zavala from death at the hands of a Red Legion Legionary, who showed his gratitude by officially calling her a Guardian. From then on, Suraya took residence at the new Tower, learning about the Last City and its history while overseeing missions in the European Dead Zone, as well as moderating the newly established Guardian Clans. Hawthorne gives players their Clan banner as soon as they join a clan, which tracks their clan progress per season. As soon as a clan completes a challenge together, she rewards all members with legendary engrams. A pre-release render of Hawthorne shows that her poncho is decorated with the Hunter insignia. It's possible that Bungie may have intended for her to be a Guardian sometime during development, or at least affiliated with the aforementioned class. Hawthorne appears to be a direct referce to the Magic: the Gathering card, Soraya, the Falconer, with the two sharing a name (albeit spelled slightly differently), as well as a sidekick. Suraya and Louis out in the forest, possibly hunting. High-poly, untextured render of Hawthorne.